Vimeo has announced two exciting new features for content creaters on the Vimeo On Demand program. 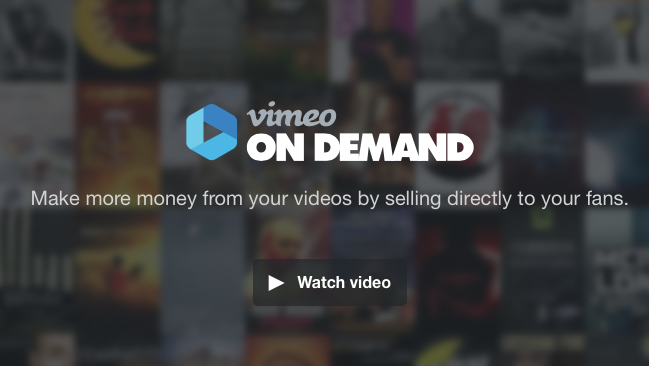 In case you’re unfamiliar with it, Vimeo On Demand is a program designed to pay content creators 90 percent of the revenue their project brings in (after transaction costs) and allow for flexibility in payment with rent, buy or subscription-based models. If you’re a member — or plan to be — here’s what was announced and how it can increase your bottom line. The first feature, “coming soon” allows you to create and manage one page that you can simply update throughout the process. What this does for content producers is simplifies the process for announcing new work (coming soon), collecting pre-orders (in pre-order) or selling in the marketplace upon release (ready to sell). Throughout the entire project you’ll use the same published page and just change the status of the project as it progresses. “VIP access codes,” the second new feature allows you to use special codes in order to change the pricing or the sales-model for specific people. The new VIP access codes allow you to grant access to specific viewers which may differ from what you’re trying to sell. For example, if you crowdfund a video project and promise each backer a copy of the final film, but only intend to sell a 24-hour rental on Vimeo, now you can give the backers a VIP access code to download the entire project, as promised, all while maintaining the rental-model for anyone else. Or, say you want to allow friends and family the ability to stream the film for free whenever they want — even if they live outside of your targeted distribution zones, you can just provide them a VIP access code that makes this possible. Options are always good, and if you’re a content creator that’s currently using the Vimeo On Demand platform to sell your work, this announcement is definitely one to be happy about.